This recent story from The NZ Herald shows that children can be taught how to care more about their own health and the environment. 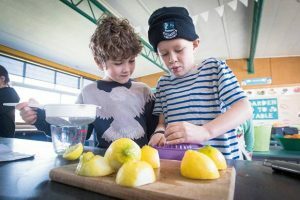 In this inspirational story by feature writer Kim Knight, Auckland chef Al Brown talks about his initiative Garden to Table which encourages primary kids to get their hands dirty by learning how to grow, prepare,took and share seasonal produce. Like me you may already know about the Garden to Table program but this story offers lots more. It highlights simple ways to cut waste, it shows the effects that cooking can have on children’s behaviour, it looks at the stats as to who (which age group) is wasting the most. It challenges us all to change our wasteful habits and to get behind our young people and to encourage them to think about where their food actually comes from and simple ways to leave less mess behind. Is your child’s lunch raising the risk of heart disease?